Everyone who would like to keep a part of his savings on the 'safe side', e.g. because he does not trust the fiat monetary system anymore, obviously wants to 'play safe' even on the subject of gold and silver! Edelmetalle direkt inspects coins and bars for authenticity, in order that you can be sure that the goods purchased from us are genuine. Naturally, this also applies for the purchase of coins and bars and the purchase of jewellery gold, old gold, and medals by us, because we have to be sure too that the acquired goods correspond to what they pretend to be. The visual inspection stands at the beginning of the authentication. The trained eye is able to eliminate with certainty several counterfeits based on experience, the comparison with reference pieces, the state of the edge and possibly of the minting- irrespective of the state of preservation. Coins and bars we trade with do not only have to be 'genuine', but also 'tradeable' from their external condition. Generally, this condition is also described as 'banking practice' (German: 'bankenüblich'). Hereby, in no case there must be damages or deformations, such as notchs, dents, massive scratches, split-offs. Silver: is usually offered as new or 'in mint condition'. This means that, in this case, there must not be any decolourations and also absolutely no scratches. Exception: circulation coins of silver, such as old 5 DM, 10 DM, 5 FF etc. coins. Other coins with decolourations are traded with deductions. Investment coins of gold: coins with copper content (alloyings), such as the Krugerrand, the Gold-Eagle, and the Britannia, can have different shades of red corresponding to the storage, which is normal. Gold coins without copper, such as the Maple Leaf, the Kangaroo/Nugget, or the Vienna philharmonic, however, should not show any decolourations. Since gold is very soft, scratches and damages arise more often here than on coins with copper addition. Principally, coins can be inspected for authenticity considerably more easily than bars. 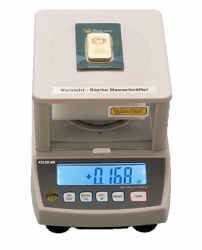 While the latter frequently vary in sizes and dimensions and are often not clearly defined, the weight, the diameter, and the density are fixed for the common standard coins of gold (e.g. Krugerrand, Maple Leaf, Vienna Philharmonic, Kangaroo, US Gold Eagle) or standard coins of silver (e.g. Vienna Philharmonic, Maple Leaf, US Silver Eagle, Koala and Mexico Libertad) and can be looked up anywhere in the internet as well as in books. So, if the defined weight, the diameter, and the density of a common coin are correct, you can assume with a high certainty that this coin is genuine. This is a practical implementation of the densitometry. A cube of gold with an edge length of 1 cm would weigh 19.32 g. A cube e.g. of lead with an edge length of 1 cm only weighs 11.34 g.
While you can check the density of coins indirectly through the weight, the density, and the diameter, you simply have to measure the volume displacement for less common coins or bars. In this case, you take advantage of the specific characteristics of water. Since 1 ccm of water weighs approximately 1 g at room temperature, one only needs a vessel filled with water on a scale tared at '0' in which you dip the gold piece to be inspected until it is completely under water, but does not touch any part of the rim or bottom of the test vessel. The density can now be calculated by the read weight increase on the scale by employing the rule of three. If the calculated value corresponds to the reference value, the density is right. Unfortunately, the densitometry, nowadays, is not sufficient anymore to check the authenticity without any doubt. In currently still very rare cases, especially thicker bars, but also coins, are 'set hard' with tungsten. Tungsten has approximately the same density than gold (19.230 g per ccm or 19.32 g per ccm), but is significantly cheaper. Fortunately, tungsten, which was used e.g. in old lightbulbs, has other physical characteristics than gold or silver. Thus, tungsten e.g. minimally attracts a magnet (paramagnetic), while gold and silver repel a magnet (diamagnetic). With the magnetic balance used by us of our partner AuroTest, we check the authenticity of coins and bars of gold and silver through their magnetic characteristics. Furthermore, the sonic speed in tungsten (approx. 5,200 m/s) is significantly higher than in gold (approx. 3,300 m/s) or silver (approx. 3,600 m/s). With the device used by us of our partner AuroTest, we check the authenticity of coins and bars of gold and silver through the measured sonic speed. You can also buy a respective testing device yourself there. You are not absolutely sure if the coins and bars acquired by you in the past from e.g. a bank or another trader are really genuine? Independendly of a purchase from us, we also check your coins and bars of gold and silver on request. In the limits of the testing devices and inspection procedures used by us, you receive the result immediately after the inspection. For the first piece to be inspected, we charge a flat fee of 25 EUR incl. VAT. For each further piece that we inspect at the same appointment, we charge additionally a flat fee of 7.50 EUR. Simply arrange an appointment for the authentication of your gold and silver stocks. Gold jewellery usually consists of alloys of different metals: red gold, white gold, yellow gold etc. We only purchase gold jewellery that shows a labelling of the fine gold content common in Germany. This 'hallmark' can be found e.g. on the necklace lock or on the 1. chain link of necklaces, on the inside of rings and bracelets, on the back of pendants. It is stated in carat or in thousandth specifications. We principally do not purchase any jewellery gold with labellings which are not listed here. Exceptions are made for medals and for coins of gold or silver which are not tradeable (anymore), if the precious metal content can be measured otherwise. Unfortunately, even pieces of jewellery with a correct hallmark can be counterfeit. In order to minimize this risk, we inspect the stated hallmark with the so-called acid test. Thereby, 3 strong strokes of the test item are rubbed off on a slate. Now, the serial dilution of the 'aqua regia' (mixture of hydrochloric acid and nitric acid), which is used as test acid, is employed. Aqua regia etches off all other metals, simply except the 'royal' gold. One first chooses the dilution of the test acid that lies one level (in carat) below the reference value stated by the hallmark. The stroke has to stay there. Secondly, the concentration which corresponds to the carat number stated by the hallmark is employed. The stroke has to stay there. Thirdly, the concentration of the test acid which lies one level over the carat number stated by the hallmark is employed. Now, the stroke has to dissolve. If the stroke dissolves already at the first or second time, the test item does not have the stated carat number, a purchase is rejected. With the acid test, only the abrasion can be inspected. Since one cannot see into the core of the test item, we have to cut mecanically through several exemplary parts of rings, necklaces, bracelets etc., just for beeing able to 'see into it' and, if necessary, to inspect an abrasion from the inside with the acid. The extended acid test with cutting through the test item as well only offers a relative safety, a certain residual risk remains. There are naturally further inspection procedures for the jewellery gold that offer a higher degree of accuracy and safety. If you allow us to send the jewellery preliminary tested by us with the acid test to our trade partner for the final inspection, our risk is minimized enormously, which is why we compensate a 10% higher purchase price here. Edelmetalle direkt is member of the German Professional Association of the Specialist Coin Shops (Berufsverband des Münzfachhandels). All members are obligated to follow clearly defined quality and security standards and to continually do further studies refering to this. The members are in close dialogue through the association. As soon as a conterfeit appears somewhere in Germany, attempted frauds are undertaken, or coins or bars are reported as stolen, all members receive a respective warning notice. This protects you as customers against rude surprises. Therefore, pay attention to this label when purchasing. 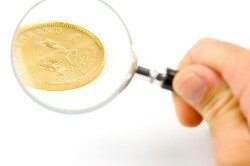 Protect yourself againgst often very cheap, but dubious 'internet bargains' of gold or silver.